Any ten-year-old kid with a PC can tell you that a modem enables a computer to transmit data to another computer over telephone or cable lines. A few smart ones may even know that modem is short for “modulator-demodulator,” referring to how it processes transmitted data. 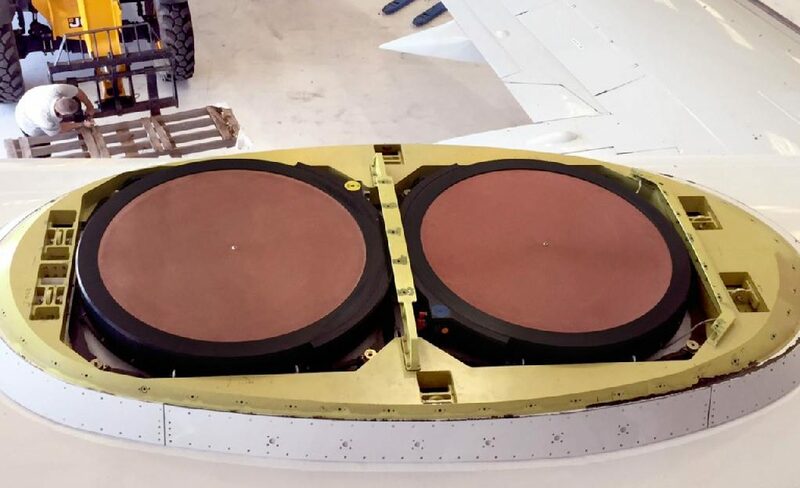 But when it comes to the kind of specialized aviation modems Gogo uses for inflight connectivity, things become a bit more complex. So what makes the inflight modem such a critical component in an aircraft’s in-cabin network? And what are the keys to modem performance at 35,000 feet? 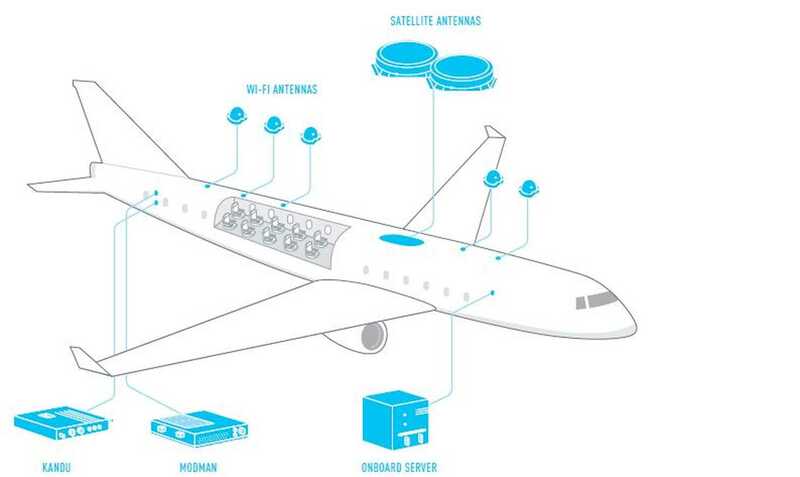 The primary role of the aviation modem is to turn satellite beams of data into a signal that can be used by the aircraft’s in-cabin network to deliver connectivity to the plane—from passenger internet to IPTV to critical crew services. Like its earthbound counterpart, the aviation modem uses modulators to convert these signals into radio frequency signals and demodulators to handle the reverse of these conversions. In a typical high-performance inflight connectivity configuration, the modem is housed within the modem manager or MODMAN. While all modems have the same basic function, the ability to deliver peak connectivity speeds via wide-band satellites varies greatly depending on the modem type. For example, on the Ku frequency band, typical modem speeds are in the 25 Mbps range. The Gogo Ku modem, however, operates at the 35 Mbps range. 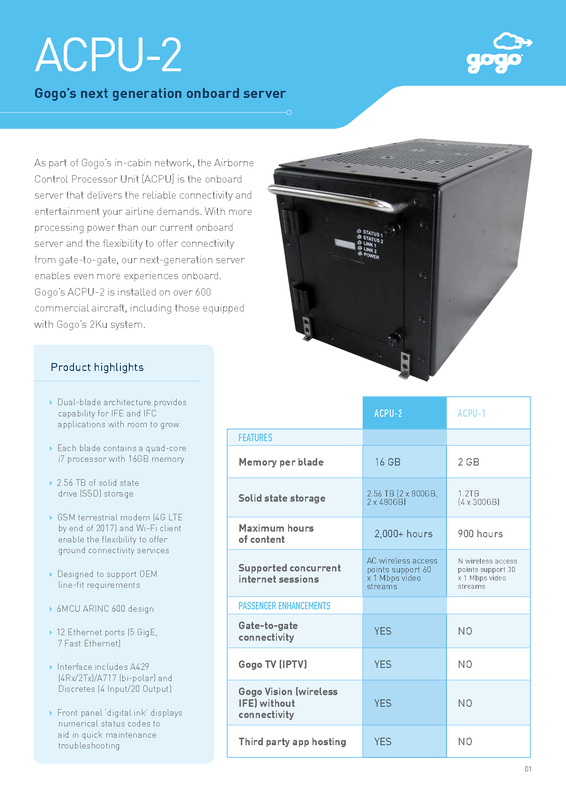 The dual-channel modem used in the Gogo 2Ku application, when paired with Gogo’s 2Ku antenna and High Throughput Satellites (HTS), is capable of speeds of more than 100 Mbps. The dual channel, high-speed modem design helps Gogo 2Ku-equipped aircraft offer 15 Mbps-plus to each connected device onboard, 98 percent service availability on every flight and 98 percent global coverage. Its greater processing power also means there are no bottlenecks in antenna connectivity so each passenger enjoys a virtually seamless online experience. 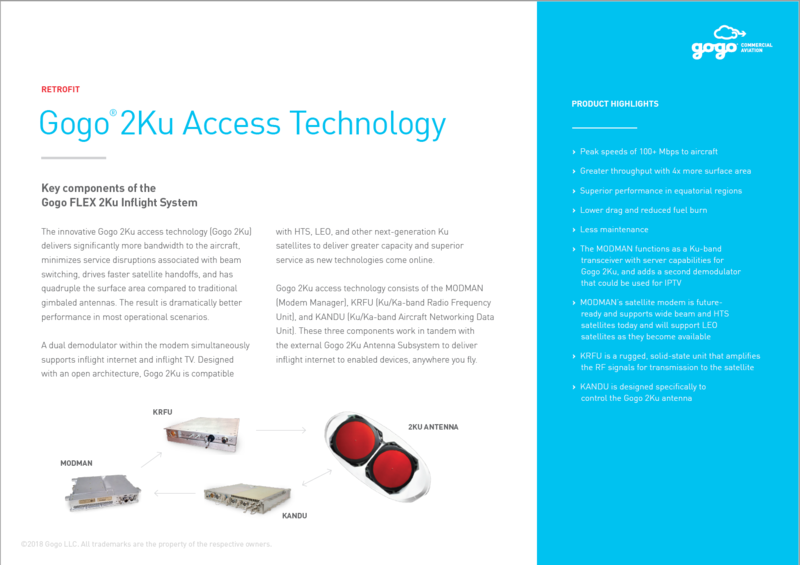 In addition, because our unique 2Ku modem includes a second demodulator, it can process two receive signals at the same time. Taking the system even further allows us to dedicate one satellite receive path to IPTV, which means more channels can be supported without impacting the available bandwidth to passengers. An important role for the aviation modem is registering the handoff from one satellite to the next, reorienting the antenna, reacquiring the signal and reestablishing the data link to servers on the ground. Satellite handoffs are difficult enough with existing wide-beam satellites. But they’re even more complicated with some of the upcoming High-through satellite networks (HTS). As these satellites come online in the near future, our modem’s ability to rapidly switch from one beam to the next is essential. Gogo’s newest inflight modem offers dramatically improved beam switching times for less passenger interruption. This level of efficiency ensures compatibility with HTS networks and state-of-the-art performance for the foreseeable future. Another key is its reliance on adaptive modulation. As the aircraft approaches the strongest part of the satellite beam, the modem “adapts” to the signal strength. This seamless operation provides higher signal efficiency to the aircraft based on the aircraft’s position relative to the beam. While passengers around the world benefit from faster speeds and more efficient beam switches, airlines will benefit from less downtime as they install these new modems. That’s because the MODMAN (which physically houses the modem) offers an upgrade path with the least impact on operations. Airline maintenance teams can swap out the old unit and install the new one in about four hours, and the aircraft never needs to come out of service. The rapid advances in aviation connectivity mean that modem technology will continue to evolve. And that’s good news for passengers who want to stream, surf or text— as well as for airlines that want to expand their services and take advantage of all the performance that Gogo 2Ku has to offer.